We actually called that this would happen at this exact point in time, based on a prediction we’d made for Twitter’s “tweet growth” in 2010 a while back. 64 million tweets per day. 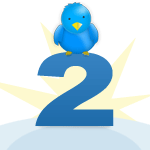 2.7 million tweets per hour. Maybe Twitter won’t quite be able to reach the almost 6 billion tweets per month we’ve predicted for the end of the year, but it’s clear that the Twitter platform is still growing at a healthy pace. Close to doubling the volume of monthly tweets in the last six months is no small feat. Note: These numbers represent all tweets that pass through Twitter, including those using the Twitter API (i.e. from apps). For an explanation of how we are extracting the number of tweets, see the bottom of this post. 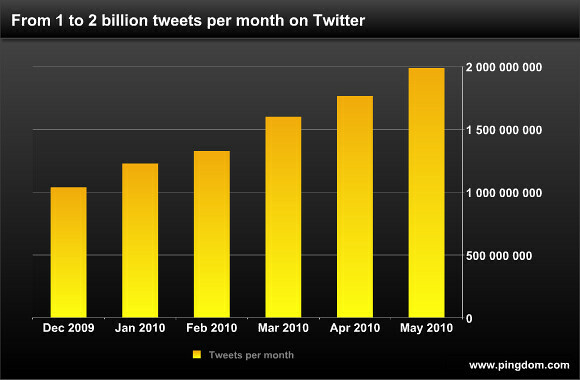 It also shows the number of monthly tweets all the way back to July 2008. Yes, but don’t forget GIGO. What percent of these tweets are worth archiving for the future? 1%? 2%? I love your method to show twitter evolution, specially graphic design.